We close with good night, good luck, a Merry Christmas, and God bless all of you — all of you on the good Earth. Merry Christmas to you all! I hope you and yours have a joyous holiday! When I was contacted about helping out, I was told a list of the duties I’d be performing. I knew that, well, of course I was going to do it when the list got to “Communicating With Santa Claus.” ‘Cause how do you NOT do that? 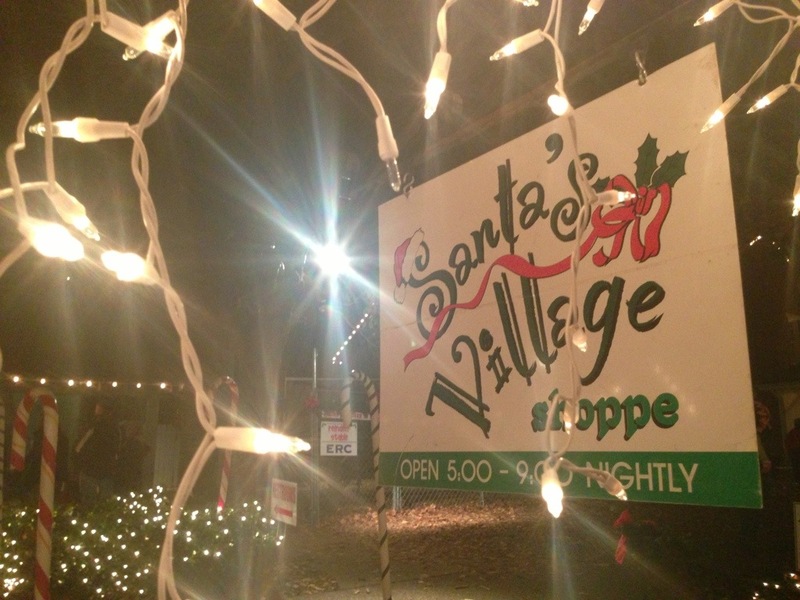 As an offshoot of my work with the EarlyWorks Family of Museums (including the Huntsville Historic Depot) over the last year or so, I’m working this month as a manager on duty of Santa’s Village at Alabama Constitution Village in downtown Huntsville. If you’ve not brought your kids before, you should — kids get to decorate cookies, write letters to Santa, hear stories from Mrs. Claus, see live reindeers, and, of course, sit on Santa’s lap and have their picture made. With the music and snow machines, it’s delightfully Christmas-y, and I’m generally fairly Grinchy about holiday stuff. Tickets are only $5 each, and it’s well worth it. I’ve been having a great time working it. The staff is wonderful, which makes my job easy, so I basically get to walk around and see kids and parents having a great time. And, on the really great nights, I manage to convince the blacksmith he should take a break, and I go in and make some nails. Only Seth was stirring; he was clicking his mouse. In hopes that St. EveJobs soon would be there. With visions of Mountain Dew, Skittles, and ribs. Had just settled down in his unique IP. Seth sprang from his chair, knocking over his Zuckuss. A complete run of whose comic was safe in Seth’s stash. Gave a glimmer like magic as off them it flickered. But a flying DeLorean with robot reindeer. That Seth knew it must be Mr. Apple himself. And, linked to them with Bluetooth, he called them by name! “Now, H4x0r! Now, Lucas! Now Shatner and Tolkien! On Gygax! On Torvalds! On Bendis and Whedon! To the top of the porch! Don’t mind the firewall! With a bunch of nerd swag, and St. EveJobs too. The prancing and pawing of each nerdy hoof. And his mock turtleneck was as black as the soot. As quick as a row of Xserves on a rack. His eyes – how they twinkled! His glasses how trendy! His smile was like Mork, his composure like Mindy! And his cool six-day stubble was flecked as with snow. And the white earphones circled his head like a wreath. And he radiated cool like Arthur Fonzarelli. And Seth laughed as he showed him his figurine shelf. Told Seth that his love of toys soon would be fed. And a cardboard stand-up of Hannibal Lector. And a set of droll T-shirts, with slogans in binary. And The Omnibus Big Book of Microsoft Jokes. He brought out the batteries – fifty or more! He gave Seth a grin, and beamed back to his sleigh. This is my public apology. I wrote a post a year ago today titled Happy Christmas that dwelt on those lyrics and how they fit my life at that moment. And that’s fine. Last year, it was easy to focus on the negative. There was a lot of negative to go around, in my life and in the lives of those close to me. There were things I’d been through in the past year that were painful. I was reading a book earlier this year that had a story about the phrase “This too shall pass.” You hear it a lot in bad times, as encouragement that things will get better. But it’s just as true during the good times, and just as good to remember — Enjoy the moment. Take nothing for granted. Live today. Love today. And, so, yeah, sure, this, too, shall pass. But, today, I’m happy. And it fit where I was a year ago. My happiness came from something that I had every reason to believe would be transitory, and rather than not being content with that, I settled. And I used those ancient words of wisdom to justify it. Make the most of today, because any happiness is transitory. There is truth in it, but it is not truth. Not everything passes. Not everything is ephemeral. And even the things that are transitory on the eternal scale can still last a lifetime, if we let them. But there are also things that are eternal. A mother’s child will always be her child, even in the next world after this one melts away. That shall not pass. In sadness, mourn as if this too shall pass, as if there’s always hope that tomorrow is better. In happiness, rejoice like this too shall pass, never take a second of joy for granted, but enjoy each one as it comes. But love like it’s eternal. Grab hold to it, and never let it go. Because it’s worth it. Fight like there’s an eternal, like we are capable of making a difference today that will resound in heaven, because we can. Treasure your parents and your children like they will always be your parents and your children, because they will. Live like you’re leaving a lasting legacy, and you will. And do it today. Treasure what you have this holiday season. I’ve been through some Christmases in the last few years that were much happier than the year had made me think they would be, and I’ve been through some that, compared to my expectations for them, just downright sucked. My biggest regret is that the ones with hurt caused me to miss the things that I did have. The things that don’t pass. May you and yours have a very, very happy Christmas. 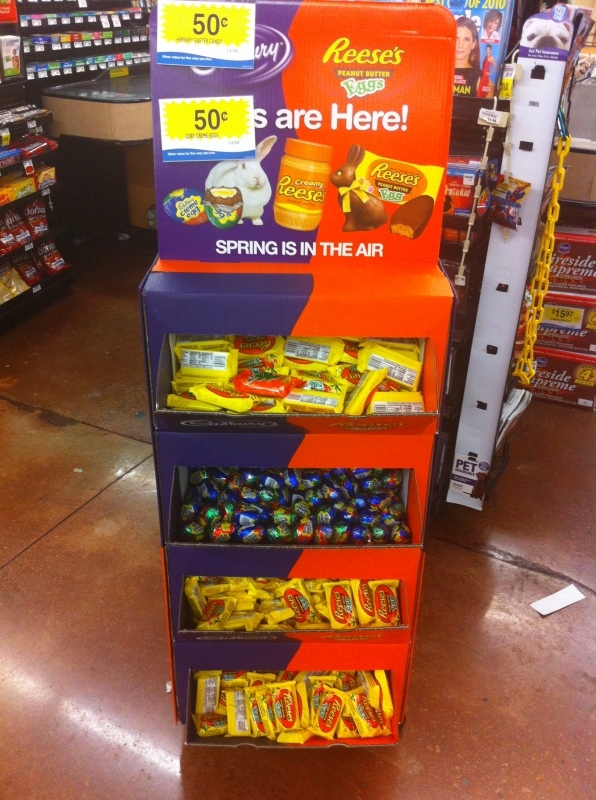 I posted a picture at the beginning of this year of Easter candy at Wal-Mart I took on January 2. But this? This is ridiculous. Easter candy before Christmas? Let’s get Christ born before we kill Him, you know? “Spring Is In The Air”? No, it’s not. Monday was still freakin’ fall, for heaven’s sake. Winter has just started; there’s a whole season before spring. It’s bad enough that Christmas keeps creeping earlier and earlier into the year. It used to be that Christmas stuff started coming out after Thanksgiving. And then, it started showing up a little before Thanksgiving. And now stores are selling Christmas before Halloween. But, you know, Christmas should be the hard stop. Nothing should be sold for holidays after Christmas until after Christmas. Maybe, maybe new New Year’s stuff. But that’s it. No Valentine’s Day, and certainly no Easter, more than four months early. There’s gotta be a line somewhere. To be honest, I really like Cadbury Creme Eggs, and would have kinda of liked to have bought one. But, dang it, I’m not going to encourage them.